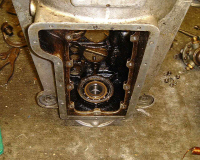 There are many crankcases around which have the front main bearing retaining lip broken or cracked. 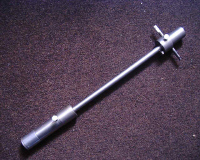 Without this lip the crankshaft cannot be held in the fore/aft direction and is allowed to float. 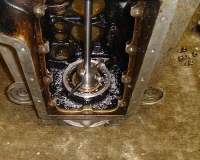 This puts a sideways strain on the pistons and connecting rods and, when the foot is applied to the clutch pedal, the crankshaft is driven forwards by the pressure on the clutch, distorting the front bearing retaining plate and altering the mesh of the crankshaft to camshaft gears. Altogether an undesirable situation. All is not lost. Those of you who have the excellent 750 Motor club publication, the Austin Seven Companion, will find a design of a tool to remove the broken lip to be replaced by a retaining plate which clamps the front bearing. The design uses 1" steam pipe which is not so readily available these days so I set about modifying the design to use materials available today. You will see from the picture that the tool consists of two larger diameter bosses turned to fit the inner race of both the front and rear main bearings. 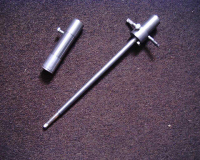 these are separated by a length of steel rod. 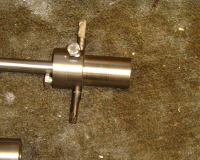 The cutters were made from broken HSS drills of about 8mm in diameter. 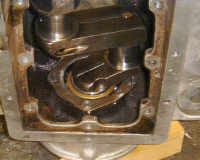 To use the cutter the front main bearings are inserted in the housing and held by the original front retaining plate. 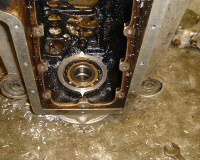 The front end of the cutter is fed into the bearing the rear main bearing is slid into place and the top end of the cutting tool is slipped into the rear bearing which is prevented from falling down by a little insulation tape wound around the lower end of the boss. In my case I arranged the tool so that an old socket spanner could be slipped over the end and a socket ratchet used to wind the cutters round. Simply apply a little pressure whilst winding the cutters and in a vary short space of time the new surface is cut so that a new retaining plate can be used. The additional retaining plate is a front bearing retaining plate with the bolt holes countersunk. Using the original front retaining plate drill out the threaded fixing holes right through into the crankcase keeping the drill as vertical as possible. To assemble insert the new retaining plate and fixing bolts from inside the crankcase. insert the crankshaft and slide on the two front main bearings. Using nuts and locking washers bolt up the original outer retaining plate. It may be necessary to use a shim to pre-load the bearings. If you follow the description in the Austin Seven Companion using this tool you should have little difficulty.